Aside from looking at your specific camera body choosing your lenses is likely to be one of the most important photographic decisions you ever make. The lens is, in many ways, the most important piece of equipment that you will own; a good lens can make up for a poor camera body, but a poor lens can render an excellent camera virtually unusable. A good choice of ‘glass’ is, therefore vital. In the first instance, it is worth looking at the variety of brands available. If you are still deciding on a camera body, it is worth looking at the range of lenses that are compatible with each of your potential choices. If you think that you are going to be limited by a small range of lenses if you buy a particular camera, then it is almost certainly worth going for something different. You should not necessarily, however, be put off by a small range of own-brand glass. There are an enormous number of third-party manufacturers (most notably Tamron and Sigma) who produce good-quality lenses which fit a huge number of manufacturers’ cameras. While it is true that own-brand lenses produce the best results, there are very few situations in amateur photography in which a third-party lens will not produce an acceptable result. The next question to ask is whether you should go for a fixed focal length or zoom lens. The distinction between these two is fairly self-explanatory: a fixed lens offers a single focal length (for example 50mm), while a zoom lens can be used to produce a variety of focal lengths depending on how the lens itself is manipulated. This is generally achieved by sliding one barrel of the lens over another. Some photographers suggest that fixed lenses are superior in terms of quality, and in many ways this makes perfect sense: if you wish to minimise distortion you must also minimise the amount of glass which is placed between the subject and the sensor or film. However, these considerations are of less importance today as a result of advancements in the production of the glass itself. There is, however, a major consideration which puts some people off zoom lenses. As a result of the increased number of reflections which occur within such a lens, more light is required to make an exposure than would be if you were using a fixed focal length lens. Thus, if you are shooting in low light conditions with the lens fully extended, you may well find that your lens is too ‘slow’. Fixed lenses have the capacity for a far greater speed, but in reality some of the cheaper examples do not really capitalise on this. Again, third party manufacturers produce some excellent models, but if you want a fast, virtually distortion-free lens you will almost certainly have to pay for own-brand glass. 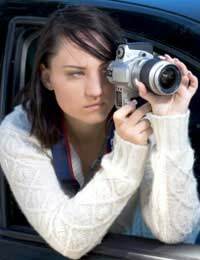 If your major consideration, however, is flexibility, and having the tools to learn your art, then you would be well advised to save the money and use it to buy a fixed lens and a zoom. A fixed lens of around a 50mm focal length will produce a pretty standard field of vision, but when coupled with a zoom of, for example, 80mm – 200mm, you will find that you have the flexibility to get the shot that you want in a vast range of conditions.